The chicken breast is sliced and seasoned with salt and pepper. 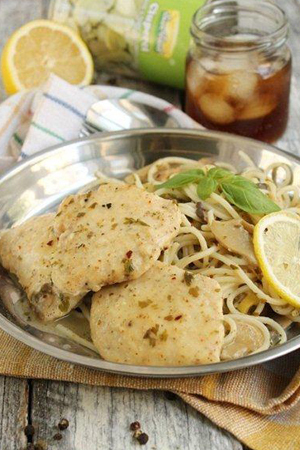 In a frying pan put 2-3 spoons of olive oil; put flour aver the sliced chicken and then fry them. In the same frying pan put the lemon juice , the lemon slices, the mushrooms and soup/wine and stir them. Boil this sauce for 5 min, then add the butter, the flavours and the chopped parsley and stir them. Then add the chicken on dishes and in the remaining sauce put the boiled pasta and cover the with sauce, serving them with the chicken.